It's interesting to note that BC is one of the only provinces to charge premiums for medical coverage. Alberta used to but they stopped doing that in 2008. Now the general tax revenue covers their medical premiums and they still dont have sales tax. Most governments, especially the BC Liberals and Gregor Robertson's gluten council are yearning to find any excuse under the sun to raise taxes so they have more money to spend. Gregor Robertson's recent publicity stunt was an offensive scam. The referendum on raising sales taxes to pay for Translink's mismanagement above and beyond the billion dollars a year regional gas tax they already burn failed. So Gregor Robertson gets a Christy Clark brainstorm. He gets the idea to pimp the fentanyl crisis and use it as an excuse to raise taxes yet again. Only this time his argument fails and we end up shooting ourselves in the foot again. Raising property taxes raises rents and creates more homeless. Gregor Robertson's tax hike was a complete scam because he raised property taxes 0.5 % to pay for more harm promotion and an additional 3.4 % to put in his own pocket for more tax revenue. He used the addicts as an excuse for him to raise taxes on other things. This hike becomes colossal when you factor in the fact that property assessments in Vancouver have doubled which means property tax has skyrocketed and is creating more homeless not less. Yet the real crunch is yet to come. The Devil's deal as promoted by Mr. Conflict of Interest, Larry Campbell wants to buy addicts prescription heroin. Who is going to pay for that? Will taxes and medical premiums continue to skyrocket or will they simply do what many Medical clinics do in Surrey and close down as soon as all the drug addicts have filled their quota so no one else can get medical treatment for anything other than drug addiction. That is what's happening right now. All the methadone patients line up at the medical clinic and after they're done, the clinic shuts down for the rest of the day so no one else can get medical treatment. At the medical clinic in Guildford Superstore, one doctor is on a three month suspension for filling out methadone prescriptions without even seeing the patients. It's big business and is part of the colossal pharmaceutical scam that is bleeding taxpayers dry. Adding prescription heroin to the list will bankrupt the public health care system faster than you can say conflict of interest. Promoting drug rehabilitation like Price Pro that help addicts get off drugs and teach them life skills will do far more in raising the quality of life for everyone including addicts and it wouldn't burn tax dollars at an unprecedented rate in favor of the Great Canadian Pharmaceutical Fraud. Most walk in clinics close "early" each day. The reason being doctors are not paid if they see more than 50 patients a day. (do believe that is the correct figure) Having used walk in clinics because I'm frequently not around where my doctor's office is, if its later in the afternoon, I'm informed they aren't seeing more patients because they have "filled their quota" for the day. I have no problem with that because doctors like any other worker ought not to have to work for free. Now it maybe the clinic you mention has "questionable" practises and others are set up to simply deal with drug addicts. You will find walk in clinics all over the province, closing when they have maxed out their limit of patients and don't have drug addicts as patients. as to MSP going up because of "free" heroin", MSP will go up because that money goes into general revenue and Christy Clark then uses it for anything she wants. Its how she arrives at her $2Billion surplus. B.C. has always had MSP but people were O.K. with it because, in relation to our income it wasn't that high. With the B.C. 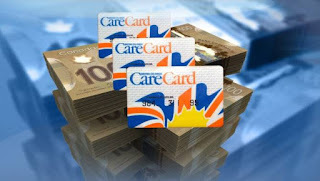 Lieberals MSP has become a cash cow which can be milked just as B.C Hydro and ICBC are. Those last 2 government entities are required to "kick over" half a billion to Christy and her b.c. lieberals each and every year. If B.C. Hydro doesn't have the money they have to raise it on the bond market. They have a deficit but the B.C. Lieberals have a surplus. With ICBC they simply raise the rates and blame the high cost of repairs on expensive cars or people who defraud ICBC. Ontario residents have a form of MSP but its part of their income tax and they pay according to their income. People would not have a problem with that. Right now our MSP for a couple is nil for those making less than $61K. but if you're making $61K plus one cent you're paying $150 per month. Doesn't matter if you're making that $61K plus one cent or $61 million a year, you all pay the same MSP. That is just another benefit of being a financial elite in this province. As to heroin being provided to drug addicts, I've no problem with it if they aren't committing crimes to get their heroin any more. Now having said that, I am of the opinion if they are on a free heroin program it would be better if that program included life skills, a decent place to live, mental health support, etc. Some people will never get over their addictions. leave them alone. those who can over come their addictions ought to be helped. this government isn't providing that help and never will. There has been some discussion in Canada about having a national prescription plan. It will actually save money. Currently there are millions of people who can not afford the prescriptions their doctors give them. When those people have mental health issues and can't afford their drugs, society has a problem. I do have a problem with that. As you say, drug addicts and their slum lords exploiting the methadone program are using up all the walk in clinic's quotas preventing anyone else from getting medical treatment. That is wrong. Prescription heroin will cause medical premiums to skyrocket and bankrupt the public healthcare system. I cannot endorse or support that. The highest paid CEO (Valeant) in Canada made 180 million in a year that saw share prices fall from over $320 to $20. Supportive housing just helps addicts maintain their lifestyle, anybody notice that some of the buildings have pharmacies built right in. I believe in abstinence first not housing because then you just reinforce the behavior. It cost nothing to warehouse them compared to the millions of dollars to keep them on life support per individuals. The advocates and the Enablers are condemning them to hell. By living such selfish self-centered lives they're aaccumulating Karmic debt that has to be accounted for in this life or the next. Remember all the coincidences and prayers answered, signs from the universe to remind us this is just one stop on our spiritual evolution. Affordable housing is important for everyone. When that is not available, people end up homeless and become victims of the predatory drug dealers that exploit and enslave them. well Dennis Watson, the year is off to some sort of start, I think this is the second time we've agreed on a subject. Affordable housing is important for everyone. If people don't have it, their health will decline. Slum lords are never to be encouraged. Jeff, if people are living on the streets it is almost impossible to get clean. Affordable housing ought not to be a reward for getting clean. Affordable and in some cases supportive housing is a right for all Canadians. With supportive housing addicts to have a chance at getting "clean" if they can. As to karmic debt and all that sort of stuff, some times what goes round comes around, but the rest of it, no life can just be a crap shoot. wrong place wrong time, bad results. It is very doubtful that karma has anything to do with being addicted or having an opinion regarding harm reduction or not. Mr. Watson and I have very different opinions on a number of matters but we do agree on some basics, one is people need decent affordable housing to get on with their lives and drug dealers ought to be arrested, oh, and Vancouver and Surrey need new mayors, there needs to be a lot more medical facilities for those who want/need to detox and get rehab. Neither one of us is right or wrong. its our opinions and neither of us will pay in the next life or this one for having our opinions. Yes affordable housing is important for everyone however Jeff does have a point. I'm all for feeding the hungry and housing the homeless. Yet many people argue that all the food lines in East Vancouver enable drug addiction. People know they don't have to spend their welfare cheques on food so they buy drugs with it. There is merit to that argument. I support the private public housing partnerships where a certain number of units in a complex are subsidized but the rest aren't. The reason I prefer that model is because often subsidized housing often become drug and crime dens. If only a few units in a complex are subsidized they have to follow the rules or be evicted. You have to think outside the box regarding situations like this when what has been tried has so clearly failed. It has been proven affordable housing given to drug addicts does not help them end their addictions. In fact, it can be argued it reinforces it (by allowing them a more stable platform from which to continue from, providing a location for others to reside who are also in the same lifestyle, provides free room and board (yes, food and amenities are given as well) so more of their own money can be funnelled to drug purchases (remember, some of these addicts have families and are not so far along as to not know what they are doing, ultimately - if they were that far along, they would be so cognitively low ("vegetables") they would be unable to even know what they needed (for addiction), how to take it, from whom to get it and how to get to where they need to be in order to get it - let alone be able to acquire the money needed or the (stolen) items needed to get that money. Yet, you cannot just allow people to be abandoned either. So, what can be done? It is pretty simple and basic. They need to be removed from their environment and negative influences while also being removed from what is causing their addiction. They cannot be merely "released" after withdrawal - that will only cause failure. They must be educated and only released on a gradual basis when the likelihood of recidivism has been made almost negligible. Upon any part of the process that indicates relapse, the person must be taken back to whatever level of intervention needs to be repeated. For success, intervention must be intensive. If it is not, then you will be back to where we are and enabling the drug crisis (make no mistake, it is a crisis, yet what we see now will be NOTHING compared to what is coming if Justin Trudeau and his ilk in the Liberal party have their way and legalize drug usage). It is not too late, but it will be if what is necessary is not done. monthly MSP premiums have accounted for as much as 30% of the total yearly medical budget in British Columbia. 3.1 billion of the 9.9 billion in expenditures of the year quoted. Asleep at the wheel, we still think our medical is free when in fact this monthly surcharge covers a significant portion of the whole. Yes, I'm working on that one thanks. Some familiar names once again. affordable housing is necessary for just about anyone making less than $100K a year in Greater Vancouver. IF the government is going to provide affordable housing it needs to be mixed housing, in terms of types of families, income, etc. That is why the co-op housing program the federal government worked, it had all types of people living in a complex and housing charges were set based on income. complexes need to be income blended for there to be success and not have ghettos. that is why its best to build small town house complexes of say 6 homes instead of a hundred. The government needs to increase the housing allowance people receive because no one can get by on the amount currently available. When people have the money to buy their drugs, at least they aren't stealing to get the money to get the drugs and that reduces the crime rate. this government is not going to provide detox and then rehab with intense follow up. that costs money and there may not be enough in it for their friends to get all the contracts. Christy would sooner people just died than spend the money on saving lives. she has a $2 billion surplus and we have yet to see nickel one for detox and rehab for even kids, so if anyone is waiting for adults to get it, not happening. Yes but Christy Clark's press conference on more money for affordable housing involves destroying affordable townhouses and building high density apartments in their place. 1) House complexes are just the slums of the future. Period. 2) "When people have the money to buy their drugs, at least they aren't stealing to get the money to get the drugs and that reduces the crime rate." Please provide any peer-reviewed articles supporting this statement (as it is quite the claim, especially unsupported with any evidence). I missed that one. Rationalizing the use of social assistance cheques on drugs with the claim that at least they aren't stealing is somewhat bizarre. Most people agree spending social assistance cheques on drugs is a misuse of those funds however meager they may be. It doesn't reduce theft either because drug addiction is like a forest fire that consumes everything in it's path. Once they spend their meager social assistance cheques on drugs that is never enough so they have to steal to feed their addiction. That is why there is a open air flea market of stolen goods in the DTES. FYI: C.B.C. 's fifth estate on their web site has an article regarding the billions over spent in Canada on prescription drugs. its interesting. thought you might be interested in view of this article.